Zoey is so excited to sell her designs at the outdoor market! But will she compromise her vision for her crush? 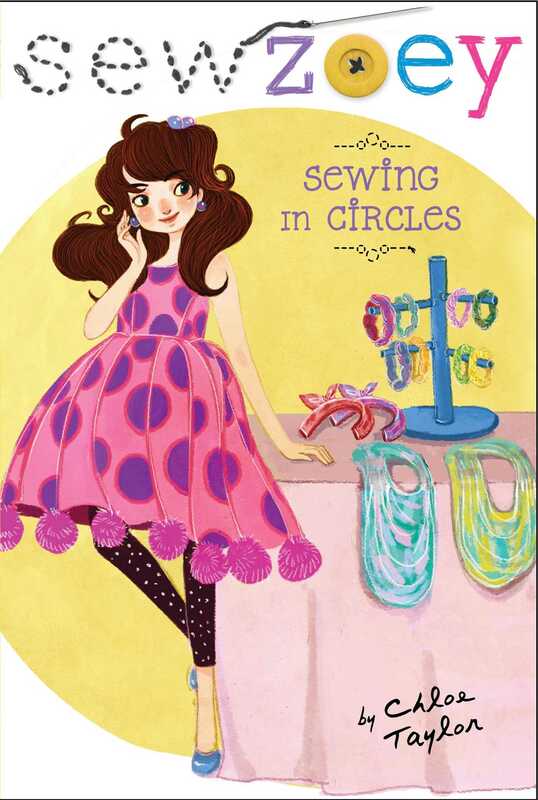 Includes “Sew Zoey” blog posts and fashion illustrations. In the thirteenth book in the Sew Zoey series, Zoey Webber is getting gifty…by selling her designs at an outdoor market! Things get complicated when her new crush asks if he can display his paintings in her booth. Her friends Kate, Priti, and Libby think she’ll be making a huge mistake if she doesn’t jump at the chance to spend time with him, but is it worth changing her vision? Then her fashion idol, Daphne Shaw, offers to feature a Sew Zoey piece in her pop-up show. It sounds great, until Daphne doesn’t like Zoey’s samples. Zoey spins her wheels, realizing that she has only ever sold her clothes online, and has never had to see a shopper’s negative reaction. What if the booth bombs? When Zoey’s confidence in her designs is shattered, can she break the cycle? Exciting news! There’s going to be a new member of the family—a baby cousin. Aunt Lulu and Uncle John don’t know yet if it’s going to be a boy—or a girl. Or if they do, they’re not telling—so I designed a unisex onesie that will work either way. Baby clothes are so cute, don’t you think? It’s hard to believe that right this minute, inside Aunt Lulu’s bump, there’s a tiny little person growing who is going to be wearing them someday. It’s hard to believe Marcus and I were once newborns, but Dad’s got the pictures to prove it. We spent a fun, but bittersweet, night looking at our baby albums. Marcus is so lucky because he actually remembers things about Mom. Me, I only know her through what other people have told me. The one thing pretty much everyone’s told me is that I’ve inherited her creativity for making clothes. What’s the sewing equivalent of a “chip off the old block”? Zoey Webber and Allie Lovallo—a fellow fashion blogger who until recently had dated Zoey’s older brother, Marcus—were browsing at their favorite store, A Stitch in Time. Even though they’d been friends before Allie and Marcus had started dating, the fact that Allie was seeing someone else and had hurt Marcus so much caused a rift in their friendship, one that Allie was trying to mend by regularly inviting Zoey to hang out. She pointed to some iridescent purple and blue glass buttons. She took a few sets and put them in her shopping basket. Zoey found small heart-shaped buttons she was thinking of using for the baby outfit she was making for her cousin-to-be. The two girls went to the cash register to pay Jan, the owner of A Stitch in Time, for their fashion finds. “Thanks, Jan!” Zoey said. Jan’s discounts really helped her get more for her money. At the nearby coffee shop, Allie and Zoey settled into two plush chairs near the front window with their mugs of hot chocolate. The girls chatted about fashions they’d seen in the latest issue of Très Chic, which they’d both received in the mail the previous day. During a lull in the conversation, Allie picked at a loose thread on the chair’s upholstery. Zoey considered the idea. It wasn’t something she’d ever thought of doing, but now that Allie mentioned it, she could see the possibilities. “It would be kind of cool to sell directly to people for a change,” she said. Zoey had only ever sold her clothing online and to friends and neighbors—never in an actual store. Zoey placed her hot chocolate on the table as she got to the question that was really worrying her about the idea. “Is it expensive to rent a booth?” she asked. “You can pick a booth size that fits your budget when you fill out the application,” Allie replied. She went on to explain that the organizers of the gift fair asked applicants to send pictures of their work, and they tried not to accept too many vendors with the same kind of merchandise. It was a carefully curated gift fair. “Do you think I’d have a chance with a Sew Zoey booth?” Zoey asked. “I’ll definitely think about it,” Zoey said. “Great,” Allie said. She looked down at her phone and smiled. Something about the look on her face made Zoey think it was about Oliver, the boy Allie had started seeing when she’d broken up with Marcus. “Are you still seeing that guy?” Zoey asked. Zoey decided to change the subject back to the safer topic of clothes. They spent the rest of the time talking about their current design projects. Zoey enjoyed being able to talk to someone who understood fashion the way Allie did—so much that she was able to relax and almost forget that Allie had ever dated her brother and hurt his feelings by breaking up with him. Well, at least until Allie pulled into the driveway to drop her back home. “So . . . how’s Marcus doing these days?” Allie asked. There was an awkward silence as Zoey tried to figure out what she should or shouldn’t say. She wished they could agree to not discuss her brother if they were going to stay friends. “That’s good to hear,” Allie said. Zoey really didn’t want to talk about her brother with his ex-girlfriend. She’d spent enough time playing an uncomfortable intermediary between the two of them. “Well, gotta go,” Zoey said, opening the car door to get out. “I won’t!” Zoey promised, and shut the door. As Allie drove off, Zoey wondered how long it would take before things were 100 percent back to normal between them. She hoped it was sooner rather than later. Being in friendship limbo was really awkward. Marcus was in the kitchen snacking on peanut butter and an apple when Zoey walked in. “Was that Allie’s car?” he asked. “She asked how you were.” Zoey sighed. “I said you were moving on,” Zoey said. “And what did she say?” Marcus asked. “She said ‘good,’ or something like that,” Zoey said. Marcus looked disappointed that Allie hadn’t been more interested in the topic of, well, him. Zoey stopped in the doorway and then turned back to face her brother. Zoey breathed a sigh of relief. “Enough to let me eat the last brownie, even though I’ve already had three?” Marcus asked with a hopeful grin. During lunch in school the next day, Zoey floated the idea of the gift fair to her friends. “She’s sold her clothes on Etsy,” Kate Mackey pointed out. “And Allie and I did the pop-up store on Etsy, too,” Zoey said. “But this would be the first time people could see your clothes in person,” Priti countered. The girls considered this as they ate their lunches. “You took a risk with Doggie Duds, and that worked out,” Kate reminded her. Zoey thought back on all the risky projects she’d attempted in the last year or so. They certainly hadn’t been without their nail-biting moments, but they’d always turned out okay in the end. She handed each of her friends unique versions of the fabric bracelet she’d previously copied for Ivy Wallace when Emily Gooding was nagging Ivy to buy one. The bracelets were all the rage after having been featured in a recent issue of Très Chic magazine. Libby’s was made of two different fabrics—one printed with little candies and the other with little carrots—to remind her of how hard she’d worked for the local food pantry for her Bat Mitzvah project. Kate’s fabric was covered in daisies, because those were her favorite flowers. Zoey figured a flowery bracelet was a subtle way for Kate to bring florals into her look. And Zoey had made Priti’s bracelet with a fabric printed with stars, to signify her friend’s love of being in the spotlight. “These are just like the ones Emily brags about all the time,” Kate, who was more into reading about sports than fashion, said. Priti and Libby stared at her, shocked. “Are you allowed to do that?” Priti asked. “You must have hundreds to write,” Priti said. “That’s because we’re not going out anymore,” Kate said. “We decided about a week ago,” Kate said. “And you didn’t tell us?” Priti said. “But why did you break up?” Zoey asked. “But you worked that out, didn’t you?” Zoey said. Kate’s smile was genuine, but Zoey couldn’t help wondering if her friend seemed just a little . . . too okay. She resolved to investigate further.